Creation Date Friday, 29 August 2014. DeepWater Desal proposed to build a massive desalination plant and a data center to help address the alarming drought in Monterey County, California. The project would draw water from Monterey Bay and could provide potable water as far Santa Cruz, Salinas, and the Monterey Peninsula. Drawn at a depth of 100 feet, the brackish water would be too cold for the reverse osmosis (RO) process involved in desalination. Constructing a data center next to the desalination plant would solve this problem and could also cut down the plant’s energy costs. 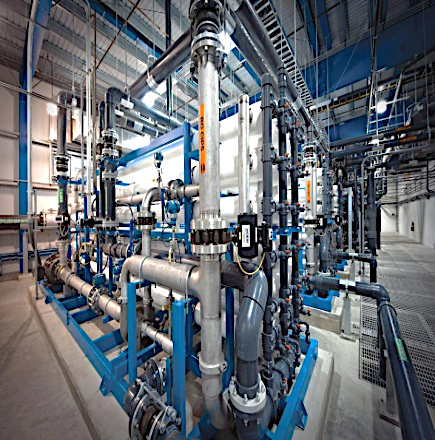 "If the water is first run through the data center cooling heat exchanger, at very little increased pumping losses, the data center now gets cooled for essentially free (just the costs of circulating their cooling plant).” James Hamilton, Vice President and Distinguished Engineer at Amazon Web Services added, “And, as an additional upside, the desalination plant gets warmer feed water which can reduce pumping losses by millions of dollars annually. A pretty nice solution." Since desalination plants are costly, DeepWater Desal’s officials suggested that water agencies along the Monterey County form a Joint Power Authority. This would help them issue a public bond measure to fund the construction. DeepWater Desal also signed up for an agreement with PV2 energy, a planned solar farm in Panoche Valley, for its power supply that would use electrical power source mix weighted toward low-carbon, renewable energy, and off-peak load operation for minimum expenses and maximum energy savings, as this also would utilize the nighttime wind power resources needed for desalination. Developments in desalination and reverse osmosis technologies based on environmental sustainability such as this Monterey Bay project help address economic, environmental, and health concerns in terms of water supply quality. Aqua Solutions recognizes the significance of highly reliable water treatment solutions, and provides premium quality laboratory water purification systems featuring reverse osmosis pre-treatment technology. To learn more about our extensive line of RO pre-filtration equipment and accessories, browse through www.aquaa.com/reverse-osmosis-ro-laboratory-water-purification-systems today.